HappiLeeRVing: Golf Trip with golf buddies. Golf Course: Venetian Bay New Smyrna Beach, FL. Cost: $55.38 - 18 holes with cart. On Monday, March 2nd, I met-up with Willy, Dave, and Bob F. at the Venetian Bay Golf Culb. This course is managed by Billy Casper Golf Assc. We played the white tees which had a rating/slope of 68.4/119 and was 6032 yards long. It was a great day weather wise for golf. With temps in the 80's and nice sunny skies it was a great day. Bob had the best score of the four for this round. But we all enjoyed a great day of golf on the course. And at the end the day had some lunch & drinks at the 19th hole. Cost: $38.50 18 holes & cart. On Friday, March 13th I again met-up with Willy & Dave. Plus a friend of both, named Bill. 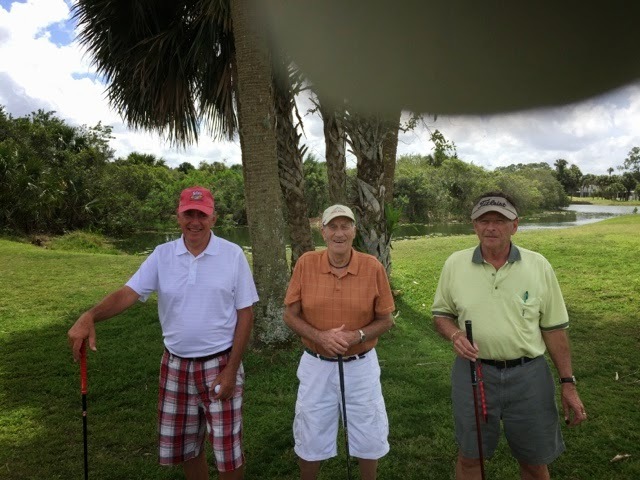 This time we played the Great Outdoors Golf Club & Resort, Titusville, FL. This was a golf resort location with many beautiful homes with RV's park along side. We played the gold tees which had a Rating/slope of 66.4/114 and was 6036 yards long. Like the first day, today also was very sunny with clear blue skies!! Again just a great day to play golf. Bill who is 84 yrs young had the best score of the group with a round of 94. On the first tee we did meet a local at this course. 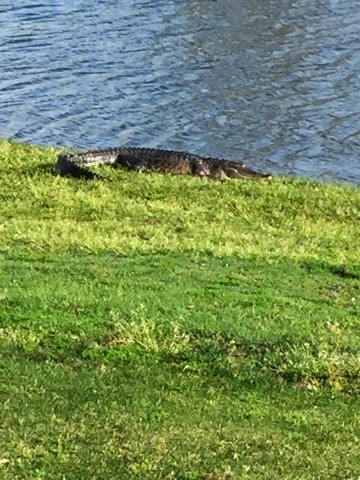 But he let us play thru. At the end of the round we all had drinks at the Blue Heron Resturant. And then I said my goodbyes to the guy's. I said that I will hope to see Willy & Dave in Up-state NY for golf in June and September.